When I booked my stay at The Renwick Hotel New York City, I picked it for its proximity to my meetings near Grand Central Station in east Midtown NYC. At the time, I didn't know what the Hilton Curio Collection was, so allow me to fill you in if you're not familiar with it either. 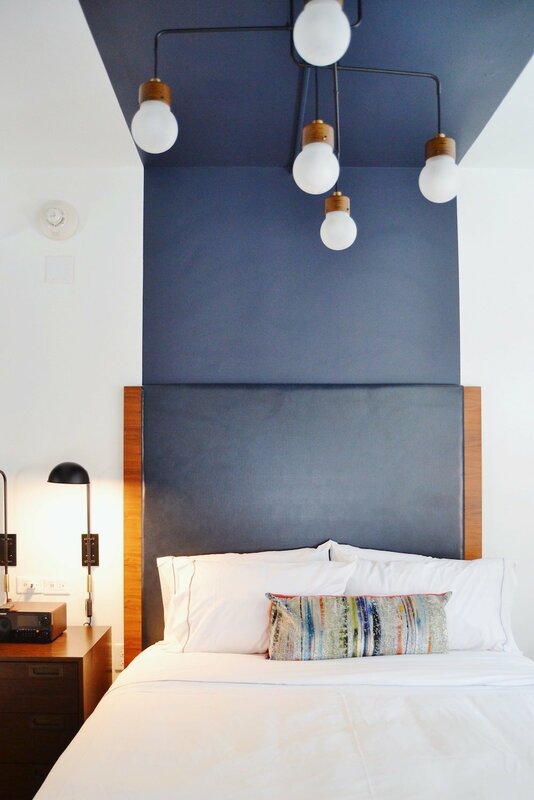 It's a collection of unique, independent hotels, including some revitalized historic sites like The Renwick with interiors and decor that match the character of the buildings themselves. We're lucky enough to be getting a Curio Collection hotel in Memphis, so I just might have to book a staycation! The Renwick originally housed artists' studios and writers like F. Scott Fitzgerald and John Steinbeck. In keeping with the building's history of creativity, my room's desk pad read "Write drunk, edit sober. - Ernest Hemingway" and the do-not-disturb sign was a paintbrush, while the pencil holder was made of clay printed like a book, and the wall contained a Thomas Mann quote: "If you are possessed by an idea, you find it expressed everywhere, you even smell it." No detail of the Renwick was overlooked, from the geometric ceiling accents and yellow accent chair to the mid century modern bedside table and vintage alarm clock. Even the bath products were special: hailing from Brooklyn, while their branding matched the brushstroke coasters. The Renwick Hotel topped all of this off with an incredible view of the Empire State Building. My only question is, when I can go back?! If you like what I've done with these photos and are looking for photos of your own space, check out my Memphis home photography page.